I couldn't help wonder if I had been experiencing problems with progesterone, since, when I first found out I was pregnant, I took my temperature and there seemed to be no rise. I used two different thermometers. Apparently the pregnancy was strong enough so that I was able to make it to 7 weeks and show an HCG level of 114,000. But now I can't help wondering if there is something I might be able to do differently the next time, to increase my chances of carrying a baby to full term. For anyone who is considering using progesterone cream, I went through the amazon.com reviews for "ProGest" cream and copied and pasted all the positive reviews that were pregnancy related. There were 19 pages of reviews (mostly from women going through menopause) so I really had to dig through them, but here they are (listed at the bottom of this post). Also I would like to note that there is some debate about whether Progesterone cream causes Cancer (for the record, I don't believe it does, and you will see why if you keep reading). 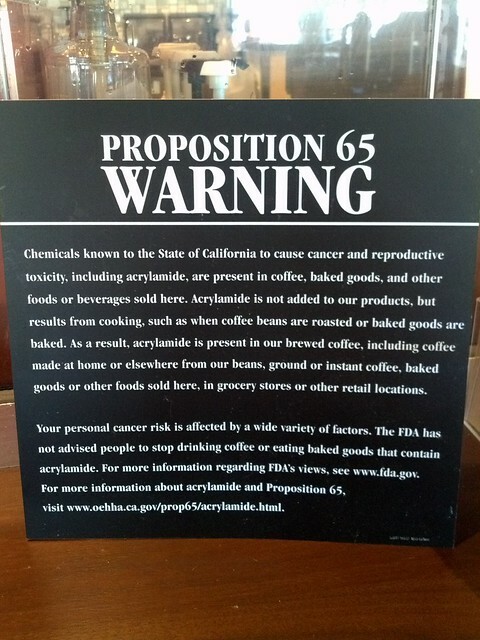 But I live in California, where Proposition 65 mandates that ALL companies selling a product with ANY type of "known carcinogen" MUST make the public aware of these facts, often with big warning signs on packaging and in stores. When you live in California, you see these signs everywhere. They're at every gas station, and even the STARBUCKS here have to put the signs up (see below a picture from Starbucks... nice way to enjoy your coffee!). Because of this, you can't even buy progesterone cream on Early-Pregnancy-Tests.com, or GNC stores, if you live in California! "California’s Safe Drinking Water and Toxic Enforcement Act of 1986, also known as Proposition 65 (“Prop 65”), contains a list of over 800 chemicals identified as carcinogens. Prop 65 mandates that warnings be given to consumers of products that contain certain chemicals identified by the state of California as hazardous. Progesterone was added to this list in 1988 based on summaries from the National Toxicology Program (NTP) and the International Agency for Research on Cancer (IARC). Both of these programs only evaluated progesterone given to animals already predisposed to cancer. Progesterone was then given to these high risk animals in very high doses. Also, these animals were given known carcinogens in addition to the high doses of progesterone. I’d like to add that most of the research originally cited by the NTP to justify adding progesterone to the list of carcinogens was largely based on synthetic progestins—apparently they didn’t realize that progesterone and progestins are very different. Progesterone cream companies that don’t add this label in California become vulnerable to lawsuits from a particularly nasty group of attorneys who are using Prop 65 to make millions of dollars. Meanwhile, there are 799 other chemicals out there, most of which probably do pose a risk of cancer." I am really relieved to have found this article, because I really do think Progesterone cream could help me with my next pregnancy, and don't want to be worried the whole time, that I'm exposing myself to a known carcinogen. It's true... maybe there just isn't enough research done and maybe it's not as safe as people think... but after reading the article, I feel a lot more assured that it probably is a lot safer than the warning label implies. My husband and I were trying to get pregnant for 9 months. We were having problems, so I did tons of research and I was trying everything! I realized we probably weren't getting pregnant because I probably was producing too much estrogen because I was obese. I bought this thinking, if all else fails, it could help with my pms symptoms right? Well I started using it right after my period in December, ovulated and conceived Dec 14... I am now about 10 weeks pregnant! I'm not saying that if you use this you will get pregnant, but it did help me because of my situation. So good luck! 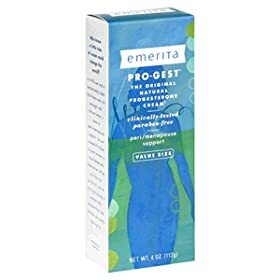 i BEGAN USING THIS PRODUCT AFTER 3 MISCARRIGES, i READ A FEW ARTICLES SUGGESTING PROGESTERONE DEFIENCY BECAUSE I HAD AT LEAST SIX OF THE SYMPTOMS I READ ABOUT. I STARTED USING THE CREAM FROM OVULATION DAY ON. wHEN MY PERIOD DIDN'T COME I CONTINUED TO USE THE CREAM TWICE A DAY UNTIL MY GYN APPOINTMENT. WHEN I TOLD MY DOCTOR ABOUT THE CREAM SHE TOLD ME TO CONTINUE TO USE IT AND GAVE ME A SCRIPT FOR PROGESTERONE SUPPOSITORIES TO USE ALSO. I STOPPED USING BOTH AFTER MY 12TH WEEK OF PREGNANCY. I HAVE NO DOUBT THET THIS PRODUCT HELPED ME NOT ONLY CONCEIVE, BUT ALSO PREVENTED A MISCARRIAGE. MY BABY IS NOW A HEALTHY, HAPPY 3 MONTH OLD BOY AND I HAVE THIS PRODUCT TO THANK. I tried to get pregnant for three years. I tried everything. I even went to a fertility doctor for a month of monitoring and diagnosis, but they found nothing. I only got the idea to take progesterone supplements because the doctor gave them to all patients after they ovulated. They didn't even bother to test me to see if I needed it. The dosage at the office was much higher. I couldnt afford to see the doctor long term. So a few months later, I started using this cream. The very first month I used it, I finally did get pregnant. My OBGYN did a blood test and found that my progesterone levels were still too low even with using this cream. So they switched me to a prescription. Still, my daughter wouldn't be here if I didn't try it. I didn't have any side effects. I would recommend this product to anyone trying to get pregnant with a short luteal phase in their menstrual cycle. I started using progesterone cream as a way to lengthen my luteal phase. Worked like a charm on the first cycle I began using it....got pregnant right away after trying for 6+ months. I saw no side effects and will continue to use throughout my pregnancy. I have also tried prometrium pills and I don't think they worked as well. When I started getting my progesterone levels checked, I was at 0.12 instead of 10 or above like the doctor wanted me at. I went on Clomid and it only brought my levels up to 0.4. I purchased this product after reading all of the reviews and started using 200 mg of prrogesterone a day. (Yes, this is well above the recommended levels but it is the amount that I read many fertility patients with low numbers like mine were taking.) After using 200mg of this product for 1 month, my progeterone level was 11.86! Which means that I actually ovulated after using this cream. I am definately happy with the results I am having with the cream and prefer using it over the pills that the doctor had prescribed. I used it due to a diagnosed Luteal Phase defect and it worked!! I got pregnant after the first time using it! (from Ovulation day on) It sustained my pregnancy long enough to get on prescription progesterone. AWESOME product!! Whatever the case, I am DEFINITELY going to be using this stuff if I ever (knock wood) get pregnant again!!! PS, Please PLAN AHEAD to get it online. I just tried to order it but not only did the price go up about $4, but the place that carries it on Amazon says it could take 5 days of extra processing, so I feel like I'd have to brace myself to wait two weeks for it arrive. GNC: Note: their online store will not ship to CA either. I checked a local store just to see if maybe it was in stock and the guy said it was sold out. Whole Foods charges $27.99 for 4 oz of Source Naturals brand, $30.99 for 2 oz of Emerita brand. Called another health food store that charges $15.49 for 4oz Source Naturals, $28.99 for 2 oz of Emerita brand, or 4 oz. $43.99, Life Flow brand is 2 oz for $24.95, 4 oz. for $34.95. I am tempted to try the Source Naturals brand since I'm a big fan of their Wellness Formula and they seem like a really good company. I will probably get their brand at Whole Foods this weekend. Update: I checked through the 120 Amazon reviews for the Source naturals brand to see if it helped someone conceive, but couldn't find any posts that said it helped someone with that particular thing : (. So, I am tempted to just throw down the extra money and get the Emerita brand. Bummer because I really love the company Source Naturals, but if I'm 44 I don't have time to experiment with different products, I need to just get the one I think is most likely to work. Last Interesting factoids about progesterone cream: I just read today that it can help women who have endometriosis. Good luck to everyone who is TTC and using progesterone cream!